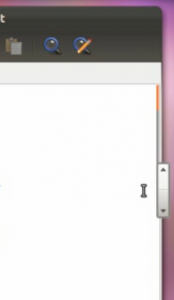 Both the application indicators and the Ayatana Scrollbars are among the key features of the Ubuntu Unity desktop. Although the application indicator is somewhat inspired from Apple’s Mac OSX but the Ayatana Scrollbars is a completely new feature that came into life because of Mark Shuttleworth and Christian Giordano. For the newbies… Ayatana Scrollbars are those strange looking (yet useful though 🙂 ) small scrollbars that replaces the Gnome desktop’s usual scrollbars that were started appearing with the Ubuntu 11.04 Natty Narwhal like 6 moths ago. The main reason behind their existence is so that by default that they’re hidden (only activated once you move your mouse hoover over the edge), it’ll give the users an uncluttered desktop + maximum “space”. From time to time the “AS” developers have made small tweaks, bug fixes and have added few new features which you should receive if you update your Ubuntu quite often. But how about getting features that are beyond the current version of Ubuntu (say, a feature that’s only gonna be available when Ubuntu 12.04 comes out for instance) ?. For that we now have a dedicated PPA and by using that, as mentioned above, we can easily have some of those upcoming features in both 11.04 and 11.10 versions. So, if you use Ubuntu 11.04 Natty Narwhal and the 11.10 Oneiric Ocelot then open your terminal window and enter the below commands. New subtle animations and timeouts just hit the development version of overlay scrollbars for Ubuntu 12.04. The tail (visual connection between the thumb and the indicator bar) now retracts when the thumb is hidden. Interesting isn’t it ;-). Enjoy!.